Mirenda Vol. 1 review: No words, all life-affirming narrative goodness – AiPT! What this comic lacks in dialogue and exposition it makes up for in emotional depth and an adventurous spirit. Call me a dweeb, but I simply adore words. The messages they convey (hunger, love, rage, misgivings about the future of the DCEU, etc.) The way the look on the page, or their sound in a crowded bar or hushed cafe booth. I even feel like some words have personalities – like, “utilized” is a tiny robot, or “mango” could be a fella in a purple Hawaiian shirt. Which is why comics are a most awesome medium: the most effective titles/stories utilize words (in all their meanings/presentations) to drive the story, set the mood, and expand upon the visuals. But what happens when there are no words (or very few)? Of course you can still tell a story, but just what happens to that tale? And does it limit the emotions or intent? 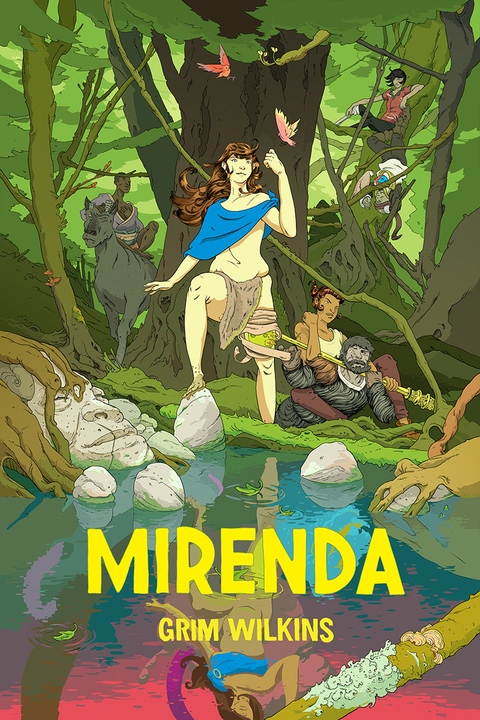 It’s those very questions that rest at the heart of Mirenda, a new graphic novel from Grim Wilkins (Petrichor and Cayrel’s Ring). In a word: mesmerizing. FLWDIL (Female Lead With Demon In Leg) and Badass Woman: These two come together to try and exorcise the demon, which becomes this massive, sprawling journey involving a lot of expert fighting, heaps of gorgeous locales and scenery, and a truly endearing friendship between two equally dynamic characters. Warrior Guy and Mega Mutt: Spurred on by a vision question to hunt down FLWDIL, Warrior Guy and his canine companion have a similarly epic journey. While clearly a secondary character, WG struggles with his task, and comes off as this rigid fantasy trope given true depth and soul. The Trio: Whereas the motivations of these three weren’t as clear as teams 1 and 2 (although they do play a role in the “finale,”) they’re certainly pure entertainment. Like some fantasy Three Stooges, the three add new layers to the larger story structure. (Apologies to all Wilkins and all stakeholders for names so dumb they border on offensive). The story itself isn’t something to get bogged down in. That’s not to say it’s not enjoyable — if nothing else, it’s an epic story a la The Epic of Gilgamesh or Odyssey, with lots of great action and twists and turns. But it’s the details and techniques that matter, and that very lack of words allows the reader to meander as they please. Whether that’s making up supporting story details or personality traits for the characters, the tome breaks down in a way that the pacing and basic composition are quite open-ended. Again, that’s not to say that there isn’t structure or crucial events; rather, that Wilkins is offering more of a guided tale than a painfully deliberate and focused narrative. He’s painting the big lines and primary details, and it’s up to the reader to provide the context and nuance that normally comes with dialogue and narration. There are still some bits of dialogue here, and even handy pictographs. These are not only more emotionally resonant for their strategic placement, but only help to further fuel the imaginative fires and inspire ideas and threads for the reader to then assemble on their own. Great stories don’t insist themselves, and leave room for readers to run off toward near-endless goals/desires. Part of the effectiveness is the artwork itself. Wilkins’ efforts are absolutely gorgeous — these huge, deeply textured pieces that blur the line between traditional fantasy and avant garde and manga. An art style that provides details while subtracting them as necessary, perpetuating the creator’s approach to storytelling and world-building. Not having words means the story’s weight rests on the visuals, and Wilkins doesn’t drop the ball for a moment. From the focus of each page and panel to how everything is laid out to the use of colors and subtle lines, it’s easy to trace the story as he intended and still wander through ideas and emotions. In several instances, Wilkins provides a quick change between pages, be it the use of black and white or a new perspective or a different scene entirely. Rather than feeling jarring, this technique is suited to both the story and Wilkins’ larger M.O., a way to shake up the story and keep the reader on their toes. More than that, there are so many deeply beautiful scenes, images that feel like singular statements. It’s these icons that allow the reader to sit down in some lush valley and contemplate this journey for a moment or two. There is something of a “twist” ending involving the titular Mirenda (that hopefully shouldn’t spoil anything). It’s huge, in a way, but it’s more a payoff. Some nougat of goodness you can find after you put in the work of travelling through the story. It’s in no way earth-shattering, but it feels just as important. Certain plot points should have true depth and impact, and this book is built in a way to help maximize the landing of this revelation and keep you wanting that next piece in the great literary puzzle. In my readings, I got to thinking about what if there were more words in the story. Plenty of snappy dialogue or profound narration. In all honesty, Mirenda simply wouldn’t be as impactful of a tome as it is now. There’s something elemental about this book, from the story and structure to the settings and character dynamics/interactions. This books means to strike somewhere near the lizard brain, that node associated with the most basic expressions of joy, curiosity, wanderlust, and sentimentality. It’s this elemental quality that transcends the use of words or other structures – a story of pure emotion and entertainment that delights and stirs the hearts of young and old alike. In two more words, totally tubular. A gorgeous collection of alluring, evocative art. An elemental story that strikes at the very heart of whimsy and adventure. Loads of room for readers to delve into the story and meander through their feelings. Some more words/narration may help bolster the story's basic structure.